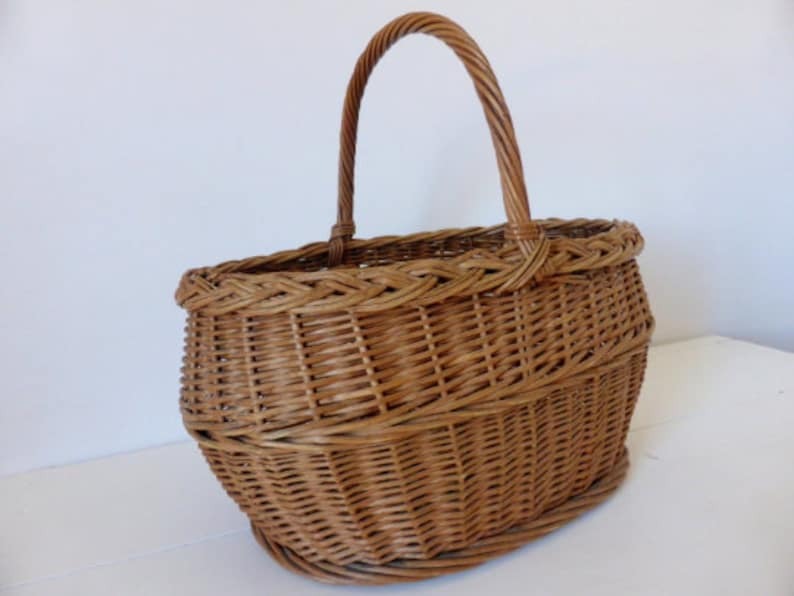 Large vintage French gathering or market basket. Sturdy design and carefully crafted. Bent twig construction. Lovely vintage patina. Nice deep basket. This basket is in very good condition with only one or two minor breaks in the splints. Great basket for harvesting fruit and vegetables but would look equally good as a market basket or to display in the home with linens or magazines, or maybe to store vegetables in the kitchen. Would make a superb wedding basket too. Lots of lovely French character. The French have a special love affair with the basket. Over the centuries, the basket has been used by households rich and poor, in the city and country, carried by men and women: a simple, universal, utilitarian item. The trade of basket making, is recorded since the late 11th century in France, and over the ages, it became highly specialized, within different regions of France and by intended use, including: harvesting grapes (each wine region, has their own unique basket shape and name), picking olives and gathering lavender, carrying glasses and bottles, making bread (in baskets with canvas lining); carrying eggs or freshly caught fish (various fish have unique baskets); raising chickens, storing wine (in glass jars covered with basketry to keep the light out); carrying firemen’s water (in a zinc-lined basket); carrying clean or soiled laundry…you get the idea.